On our last trip through Babcock Webb Wildlife Management Area before they closed full vehicle access after hunting season, I took along my tripod to see if it really made a difference in my pictures. I learned it makes a huge difference. This shot was taken at full zoom (24X) and has been cropped and re-sized. The flock of Great Egret could barely be seen with the naked eye. 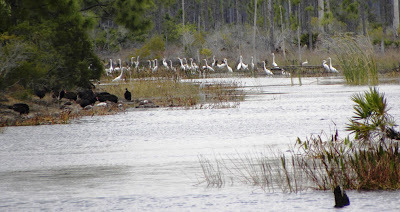 The committee of buzzards on the left are feasting on the dead fish produced by the long spell of cold weather and hard freezes here in Florida. Dead fish are washing up everywhere - including the beaches. Thank goodness for the buzzards! 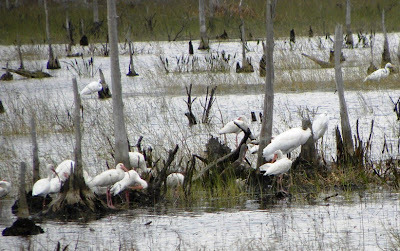 This is another of the panoramic shots that I was able to crop way down so I could identify all the various species including a Wood Stork. 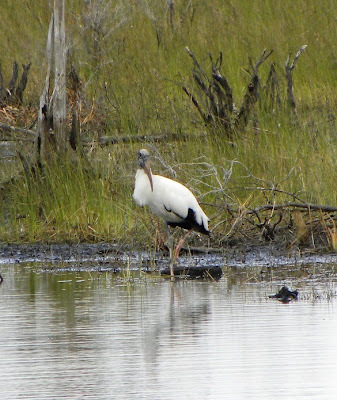 Another of the several Wood Storks we saw at Babcock Webb. "The wild hog is not a Florida native, and may have been introduced by explorer Hernando DeSoto as early as 1539. They may weigh over 150 pounds, and be 5-6 feet long. They travel in herds containing several females and their offspring. 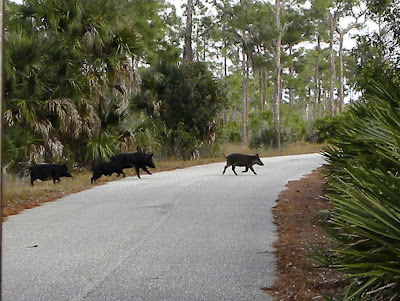 Wild hogs occur throughout Florida in various habitats, but prefer moist forests and swamps, and pine flatwoods. They are omnivorous (eating all kinds of foods, both plants and animals, indiscriminately) and feed by rooting with their broad snouts. They may cause great damage of the understory and leave an area looking like a plowed field." 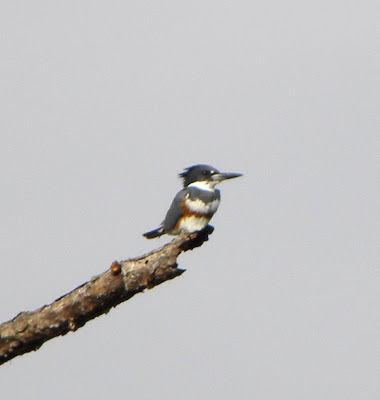 I've been trying to get a decent picture of a Belted Kingfisher. Not bad but I will still be working to improve on it. Most of the birds I photograph will not sit still while I set up a tripod - heck, they barely sit still for me to point and shoot! This very tiny sandpiper was hunting for food along the side of the lake. 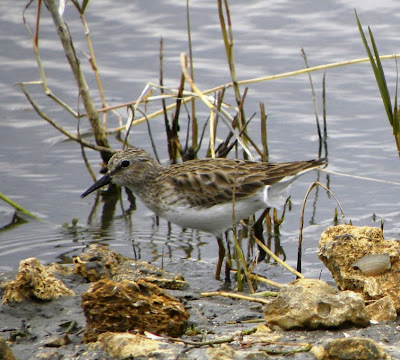 I think it is either a Least Sandpiper or a Western Sandpiper. I think it may be a Western as his beak looks a little long for the Least but maybe not! Yes, that was my other choice. You are probably correct. Why Do I Listen to Bill?